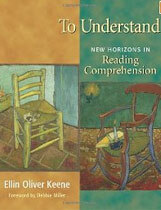 Ellin Oliver Keene has been a classroom teacher, staff developer and adjunct professor of reading and writing. For sixteen years she directed staff development initiatives at the Denver-based Public Education & Business Coalition. She served as Deputy Director and Director of Literacy and Staff Development for the Cornerstone Project at the University of Pennsylvania for 4 years and now consults with schools and districts around the country. 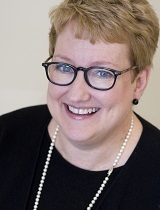 Ellin Oliver Keene is author of To Understand (Heinemann, 2008), co-author of Comprehension Going Forward (Heinemann, 2011) co-author of Mosaic of Thought (2nd Edition, 2007), and Assessing Comprehension Thinking Strategies (Shell, 2006) as well as numerous chapters for Reading textbooks and journals as well as education policy journals. The renaissance in comprehension instruction launched by Mosaic of Thought has led to changes in hundreds of thousands of classrooms, where teachers now model reading strategies, and students probe meaning more deeply. But no book in the field has satisfactorily answered the question: What does it really mean to comprehend? In To Understand, Ellin Oliver Keene not only explores this important question, but reveals what teachers can do to encourage all students to engage in deep understanding far more consistently than before. In discovering what's really behind comprehension, To Understand goes well beyond comprehension strategy instruction. Keene identifies specific Dimensions and Outcomes of Understanding-characteristics identified in readers with a highly developed ability to make sense of text-to help you rethink what comprehension is. She demonstrates how to leverage the Dimensions and Outcomes into relevant, provocative, memorable instruction. To Understand proposes a model that incorporates all aspects of literacy instruction-word learning and comprehension-and describes how teachers can focus on what matters most in literacy content. Keene shows that when teachers target the most essential content, they have the time to help every student engage more deeply with texts and discover a passion for reading and learning. The model is founded on four simple, but powerful concepts: * Focus on what's important by teaching vital concepts in depth rather than skimming over nonessential skills * Use research-based teaching and learning strategies, including proven-effective comprehension and language-based strategies, then taking them further by showing students how the strategies lead them to a fuller understand of a text * Teach the essential concepts over a long period of time so that children have an opportunity to learn not only a comprehension strategy, but to explore where that strategy leads in their understanding * Give students numerous opportunities to apply the concepts in a variety of texts and contexts. With To Understand in hand, you'll find new ways to draw out the innate intellectual interest in every student and spark dramatic improvements in literacy learning and comprehension, even among students who struggle. You'll see that by rethinking what it means to understand-by teaching children the Outcomes and Dimensions of understanding-you can help students exceed expectations while broadening your vision of their abilities, their capacity, and their energy for learning. There's still more-much more-to learn about comprehension. Read To Understand, join Ellin Oliver Keene, and discover that what's at the very core of comprehension can not only reinvigorate your teaching but take your students to new, uncharted levels of learning. Ellin Oliver Keene and Susan Zimmermann have returned with a new edition of Mosaic of Thought that features 70 percent new material. When the first edition published ten years ago, Mosaic of Thought became a runaway best seller as the first book to explicitly describe the use and benefits of strategy-based comprehension instruction. Since then comprehension strategy instruction has exploded, leading to numerous inspiring variations on Mosaic's instructional principles, as well as a widening of the comprehension research base. Now the second edition offers up-to-the-minute insight for classroom teachers, literacy coaches, and school leaders everywhere, and reminds everyone of precisely what effective, long-lasting comprehension teaching looks like. Mosaic of Thought, Second Edition, has been carefully revised and reflects Keene and Zimmermann's latest thinking. It's designed to help teachers implement practical, thoughtful ideas for teaching comprehension in contemporary classrooms through the seven core strategies that successful readers use to engage with texts. Packed with new classroom examples, grounded in the latest research, and written in the same accessible tone as the first edition, reaffirms the essential elements of powerful comprehension teaching introduced in the first edition while adding and updating features, including: * Key Ideas sections for each strategy that describe crucial comprehension concepts * new classroom examples that show comprehension strategies put into action in dynamic, literature-rich, current classrooms * new opening vignettes that illustrate the concepts students will learn through explorations of the thinking used by proficient adult readers * new tools to help teachers create effective reader's workshops * innovations from teachers around the country for fine tuning think-alouds and conferring practices * new advice on long-term instructional planning. * Keene and Zimmermann have also created an invaluable Q-and-A section with smart, informed responses to the questions that today's teachers most frequently ask about strategy-based teaching. Whether you are just now joining the hundreds of thousands of teachers who have made Keene and Zimmermann their central resource for comprehension teaching, or whether you've relied on their advice for years, Mosaic of Thought, Second Edition, will change your literacy instruction-and possibly your own reading-forever. It's filled with vital, new information, new research, and proven practices. Read it today and give your students strategies for connecting with texts that will last a lifetime.